Combining with the merry atmosphere, peach blossom, apricot blossom and kumquat trees are showing off their beauty with striking colour for traditional Tet. Vietnamese people decorate their houses and offices with these ornamental plants during Tet as symbols of warmth, wealth and good luck for the country’s biggest holiday. Peach blossom is traditional at Tet in the North while apricot blossom is traditional in the South. The kumquat tree with its ripe deep orange fruits is popular throughout the country. A kumquat tree with many fruits makes a house brighter and warmer, especially in the cold weather in the northland. The tree is a popular decoration for the living room during Tet. Its many fruits symbolize the fertility and fruitfulness that the family hopes will come in the coming year. The more fruit on the tree, the luckier your family. Greeting cards and good luck symbols are hung from the Tet tree. 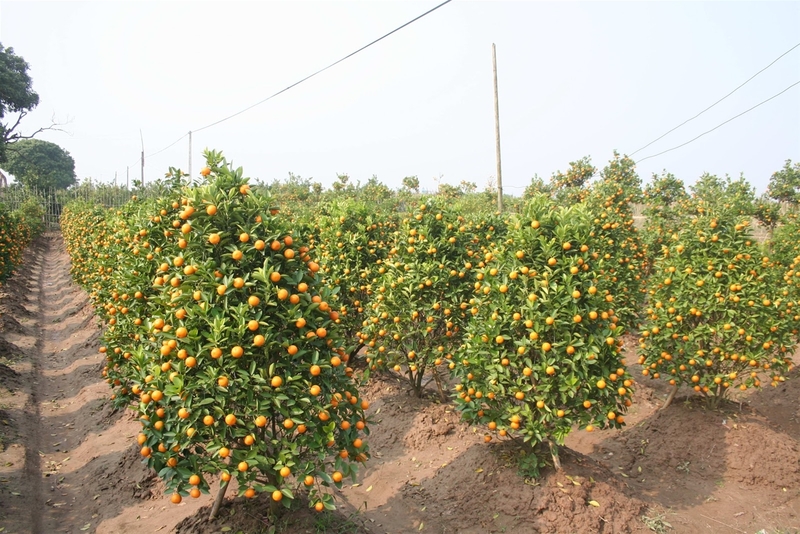 Therefore, kumquat trees of about two or three feet tall are carefully selected and prominently displayed during Tet. The bushes of the tree have been precisely pruned to display ripe deep orange fruits with smooth clear thin skin shining like little suns or gold coins on the first day of the lunar new year. Other fruits must still be green to ripen later. This represents the wish that wealth will come to you now and in the future. The leaves must be thick and dark green with some light green sprouts. The fruits represent the grandparents, the flowers represent parents, the buds represent children and the light green leaves represent grandchildren. The tree thus symbolizes many generations. Guests will caress the light green leaves about to sprout and compliment the discerning host who chose so carefully. 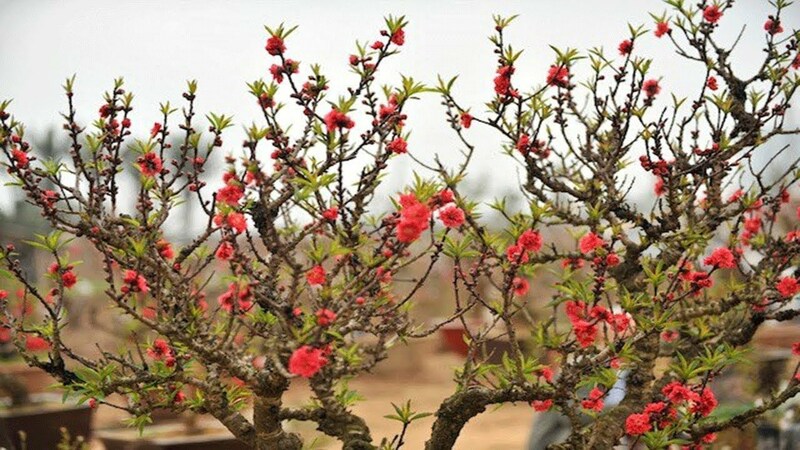 Talking about ornamental plants for Tet, you cannot forget peach blossom and apricot blossom, considered as traditional Tet’s flowers. Apricot blossom is present at most families in southland and peach blossom is more popular in the northland. They mark the end of winter and the beginning of spring. They bring good luck to your houses in the New Year, their colour is the symbol of happiness. They are absolutely beautiful when they are ful bloom but they also really impress when they are tumbling down in the drizzling, cover the ground by pink petals. Peach blossom is an enduring symbol of the Lunar New Year. You can visit Nhat Tan (Hanoi) where the delicate art of growing the trees is passed from generation to generation. According to Vietnamese legend, once upon a time, in the East of the Soc Son Mountain, North Vietnam, existed a gigantic peach tree. The tree was so huge that its shadow extended through out a large area of land. Up on the tree, lived two powerful deities, Tra and Uat Luy. They protected the people of the land in the surrounding areas from the devils. The devils were so afraid of these two deities that even the sight of the peach tree haunted them. However, at the end of every lunar year, these two deities had to fly back to heaven for an annual meeting with the Jade Emperor. During this time, the devils took advantage of this opportunity to harass the peaceful inhabitants. To fight the battle against these devils, people came up with the ideas of display a branch of the peach tree in the house to scare away the devils. Since then, it becomes a custom of the North Vietnamese to have a branch of a peach tree during Tet season to protect themselves against the Satan soldiers. Those who do not have peach tree can draw the figures of the two deities, Tra and Uat Luy, on red paper, and display them in front of the house. People say that if you have not had any apricot blossom in your house, that means you have not prepared for Tet. 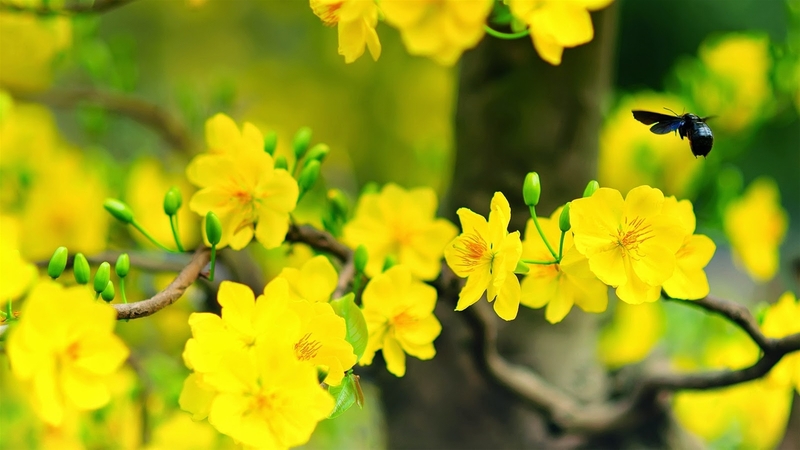 It is compared as the symbol of the spring in Southern Vietnam and it has the similar important role like the Christmas tree on the Christmas holiday. At the moment of the previous years, if you go around a city, specially to the flower-show, you can see the yellow or the white everywhere, that is the color of apricot blossom. Although apricot blossom are planted mostly in the southland, now you can easily buy one in Hanoi. Apricot blossom is more commonly used for this ceremony in the South because of the warm weather. Apricot is a small, yellow or white flowering plant that is used for decoration during Tet with the meanings of prosperity and well-being for the family. The value of these flowers is determined by the number of petals - the more petals, the more expensive the flower. Lunar New Year or Tet is a fete of the family, and the time for family members to gather at home to enjoy warm atmosphere. Every Vietnamese family has their own way celebrating the New Year, but they share the same symbol of Tet in their mind, which distinct Vietnamese cultural characteristics. The symbol is an indispensable part of Vietnamese traditional Tet, and brings the Tet flavour to every family when the day is coming. In addition to such national dishes and products as "Fat pork, salted onions, parallel sentences written on red paper. Long bamboo poles planted upright, strings of fireworks and square glutinous rice cakes", it is indispensable for each Vietnamese family to mark their Tet by colorful golden kumquat trees, peach blossom as well as yellow apricot flowers as the symbol of good fortune for the coming year.